This is the conclusion of the series, in which I tried to tell a story of people who were brain-washed" by the society to sacrifice themselves for the sake of their companies. I brought coin-operated lockers into the exhibition space where the floor was coated with raw cement. There was a huge advertisement on the surface of the 1ockers alluring people to go to the world of death. You could see neckties sticking out of the doors. 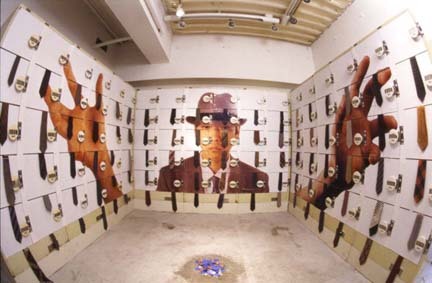 In the 1970's, a number of babies were found dead inside of the lockers like this at the stations in Japan. They were called "coin(-operated) Iocker babies" , being left behind by their self-centered parents. This becanre a serious social problem then. Twenty years later, it seems to me that the situation has been getting more serious to the extent that even adults, under pressure of the society, would commit suicide in the very same place as the abandoned babies. In fact, the hotrifying nerve gas attack on the subways in Tokyo occurred only six months after I held this exhibit. By brain-washing , the cult turned its followers into a group of murderers who had no regard for life. As a reslult, the weak side of human mind that I had been engaged in throughout the series was revealed. It may be the time for us to reconsider our mind and ourselves.